The “sacrifice” (by taking away his immunity and arresting him) of President Otto Pérez Molina, whose government was promoted, financed and its ministries occupied by corporations and the military, is an attempt to “redeem” the Barrabases of Guatemala who robbed and pillaged the State and the people’s wealth for almost two centuries. Now that the corrupt criminal ringleaders have already been identified and arrested or imprisoned, will the anti-corruption heroes reveal the names of the fraudster corporate leaders who head and make up the corruptors’ criminal network? In the city squares, do residents, civil society, students, etc. continue to also call for the punishment of the businessmen who blackmailed the corrupt Government? Do the rich continue to issue calls through the media for city dwellers to mobilize to punish corrupt businessmen and military? 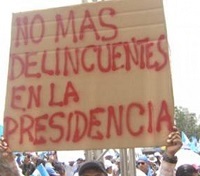 How does Guatemala look now to the international community with an arrested and humiliated Head of State? It was impressive how the main criminals, over these 4 months of urban outrage, were replicated in the multitudes of protestors demanding the renunciation and punishment of their peon of a government that had siphoned off the booty of their corruption. To the degree that they not only ended up directing and planning the demonstrations and stoppages, they also succeeded in wiping away any possible suspicion on the part of townspeople against them. The Barrabases were “replicated” in the squares, in the midst of emotional people screaming as loud as they could, Crucify him!, Crucify him! There is no doubt: Mass media is able to convert criminals into heroes. It is not necessary to re-found the State. The political and judicial system do function. Those 132 deputies who yesterday (1 September) unanimously impeached President Otto Pérez, only three weeks earlier refused to decide upon a similar petition. What “sublime” interests set off this “honorable” decision that ignited such a euphoric festival among the residents of almost all the cities in the country? 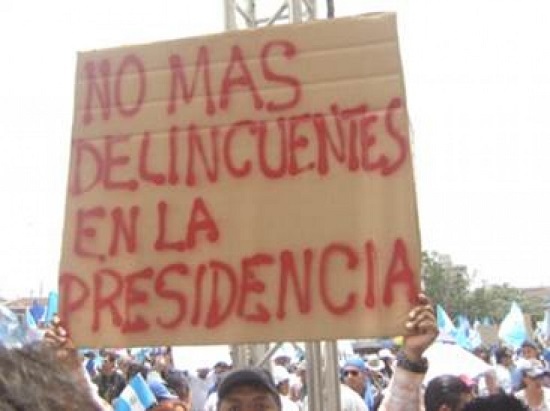 “The humiliated Congress of the Republic does function, and there is no reason to negate votes or be absent from the next elections,” seems to be the key message implanted in the minds of citizens, who until yesterday were determined to cancel or invalidate their votes in order to punish non-working and corrupt deputies. This weekend’s general elections were saved! If the general elections are saved, so are the countless monetary investments made by financial institutions in the electoral campaigns of their candidates/peons. In other words, if there are elections and a new government, then the revelry at the “democratic banquet” of the financial companies will go on, just now with a new reordering of criminal networks. If the elections and electoral investments are saved, then the corrupt political system that converted the State into a gendarmerie of abusive and invasive private (national and foreign) investment is saved, too. The neoliberal banquet bacchanal of the corporations is here to stay for a while. If the judicial system works, then, “the laws and the Political Constitution serve their purpose and are effective. So why think of Constitutional Assembly procedures to change the internal judicial order of the country. It is not necessary to think of electing judges and magistrates by popular vote.” That’s the other message. We have won. Let’s go home. One of the major achievements of this theatrical deposal among the élites is not only the conversion of criminals into heroes (corrupt corporate leaders and military), but also the demobilization or control of impetuous mobilized and outraged townspeople who like a volcanic magma run the corrupt of everywhere to justice. After the almost orgasmic “deposing” party, where they beat piñatas (Roxana and Otto, replicating the major criminals), it seems the townspeople will enjoy instances of resolution/satisfaction, without great care. However, the criminals will continue controlling and managing all “the lines”, including the failed State, which now has evidently been converted into a structure for their mischief. In this way, with the possibility of the townspeople’s demobilization and the “normalization” of the general elections to relegitimize the morally incorrect, Guatemala’s bosses will be avoiding the democratic Bolivianization or Ecuadorianization that got rid of their abusive (rich, neoliberal) colleagues in those countries 10 years ago. Are all those who celebrated “the democratic triumph against corruption” naïve and ignorant of this crude theatrical reality? Will it be that by taking away the immunity of these two criminal ringleaders, this country will resolve its original or capital sins tying it to its disastrous destiny? Will organized indigenous and campesino communities in resistance renounce their agenda to re-found the country through a popular, plurinational, constitutional process?